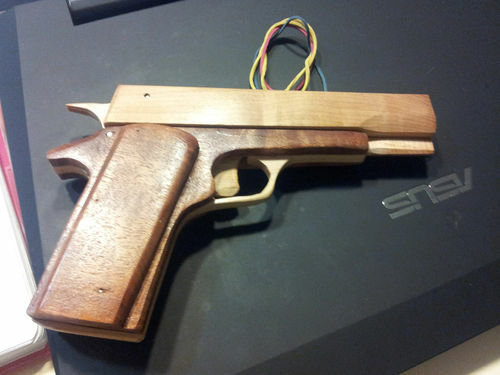 1911 Automatic Rubber Band Gun with working slide. 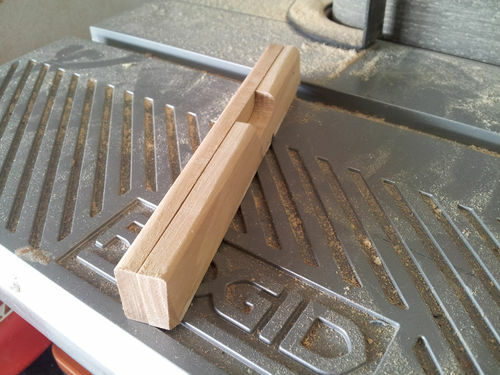 This is not an easy project you will use all your woodworking skills. He asks you do not use these plans to make money or resell the guns. I have to honor his wishes and hope you do as well. Also.. Watch his video I am sure it will fill in the blanks that I miss. I have also converted the metric over to inches. 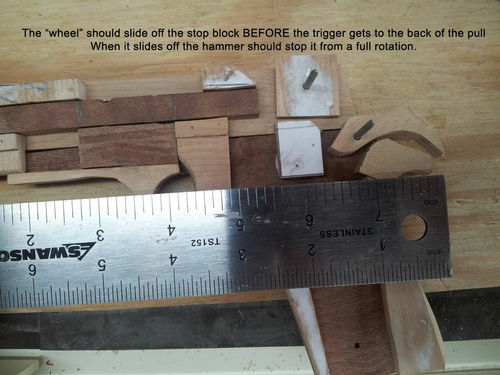 As always… It is required you wear all safety gear, practice safe woodworking, no shortcuts and this is all your responsibility. By taking this project on you agree to abide by the rules. This will give you the diagram and part cutouts you need. Choose 3 boards ( I like to mix the wood for contrast). 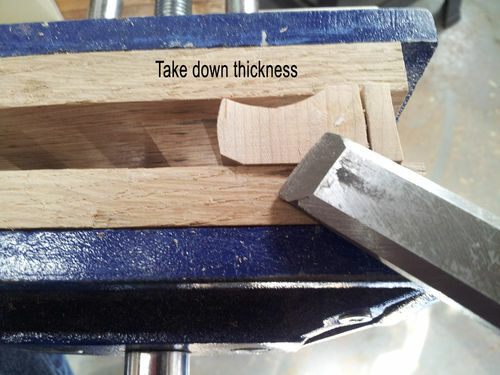 NOTE:::: PAY ATTENTION TO THE THICKNESS. THEY ARE EXTREMELY IMPORTANT. 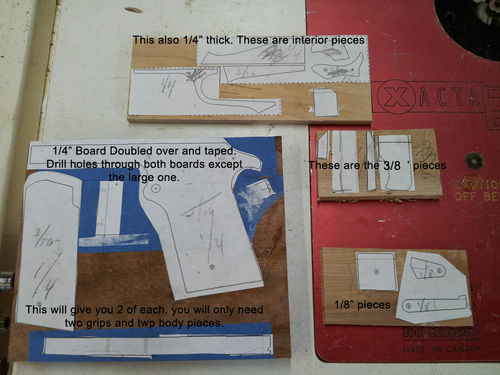 Print out the PDF and cut out the images and pieces pasting them to the correct board. 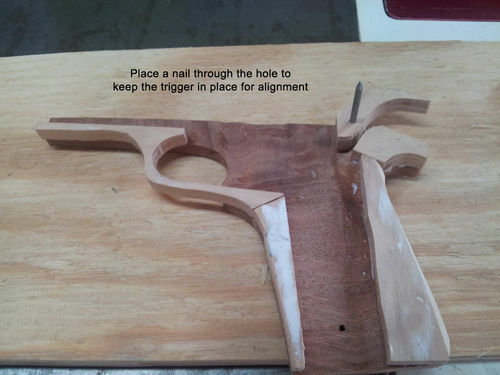 The slides, trigger and hammer should be a hard wood. 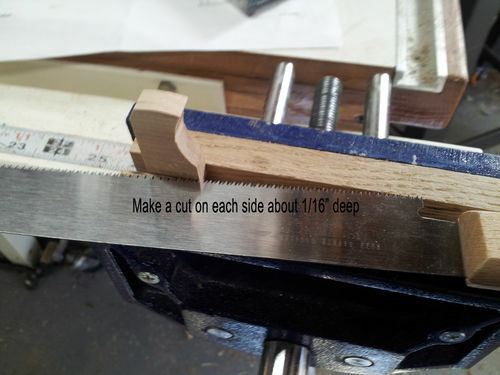 The holes should be drilled before you cut. I used a drill press because the holes have to be perfectly straight. I also did not drill out the large hole for the safety switch. I just didn’t like it. The doubled up piece is so your body and grips match. One slide is different since it has notches and the ejection port. So once you cut it out separate them before you proceed. 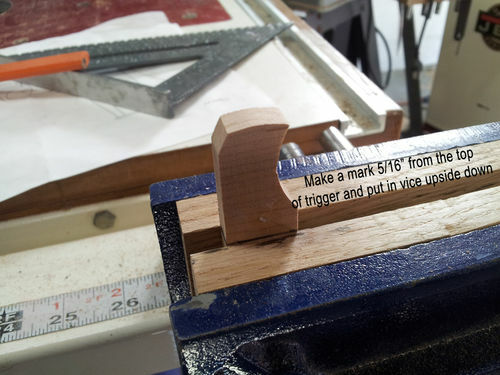 Cut out your pieces and keep things STRAIGHT and FLAT. I cannot emphasize this enough. Sand edges and round the edges on the top of the slides. Sand and smooth each piece. Be careful not to remove to much material. When you are satisfied… Move on to next step. These pieces slide on the body parts. 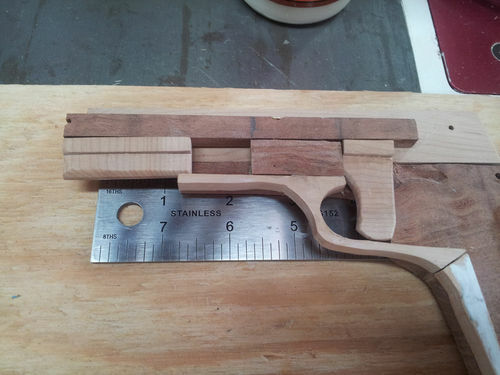 They need to be shorter than the barrel block when assembling, so more trimming might be needed. The rest of the pieces can be placed as shown. 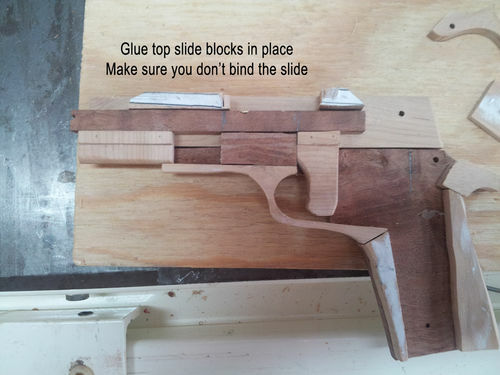 IMPORTANT NOT TO GET GLUE WHERE THE SLIDE WILL SLIDE. 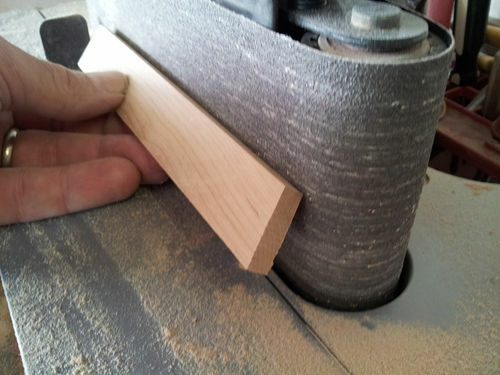 Place the right side slide in the forward position. Line up the parts using the page one from the PDF. Thanks for a great, in-depth and well photographed blog! Definitely a favorite and on my list. Wow!!! Just wow! Love the detail and photos! Well done! 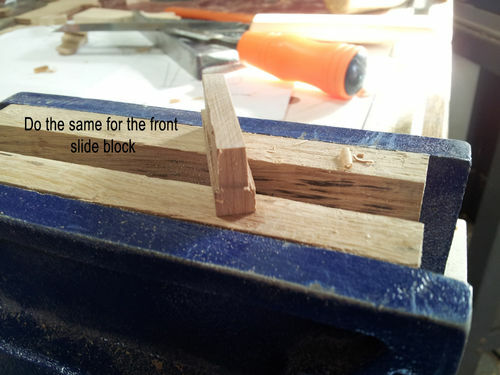 Insert and glue the top slide blocks. This is a really tricky part and take your time.. Put the three pieces together. 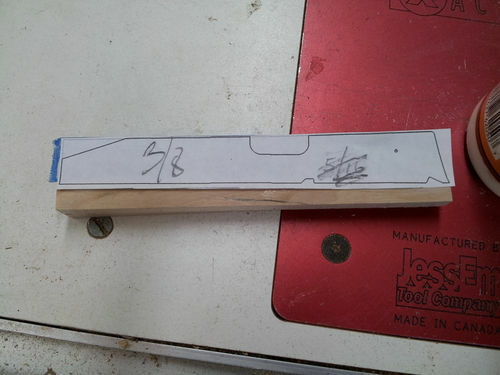 Make sure the slide moves easily and does not bind. 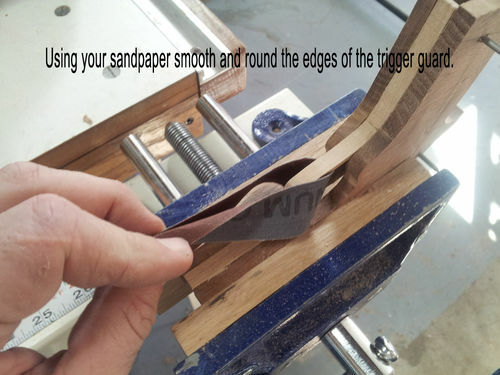 If it does, sand, scrap, chisel, adjust until it does. The place a nail in the “wheel” hole and the trigger hole placing those pieces in place. Temporarily put the wheel stop block in position as shown.. NOTE the position. Slowly move the slide back and when the trigger gets near the back of the guard the wheel should clear the stop block!!!!! 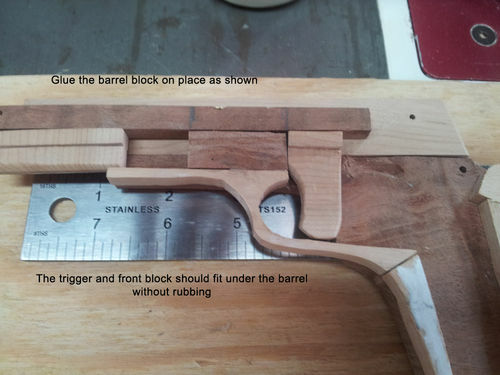 By the time the trigger is fully depressed the wheel should be clear of the block and then hitting the hammer. Take your time and make sure otherwise it will not fire correctly. 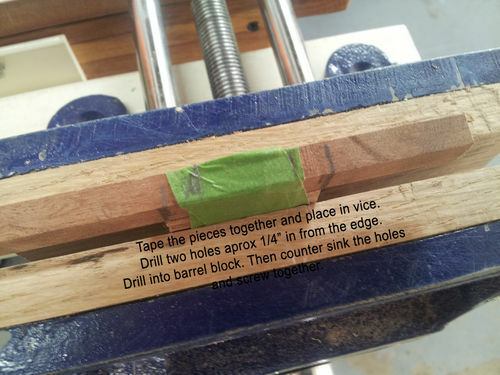 Using the nails you have in place slide the left slide in position and glue. Again make sure nothing binds up the slide action on the barrel. 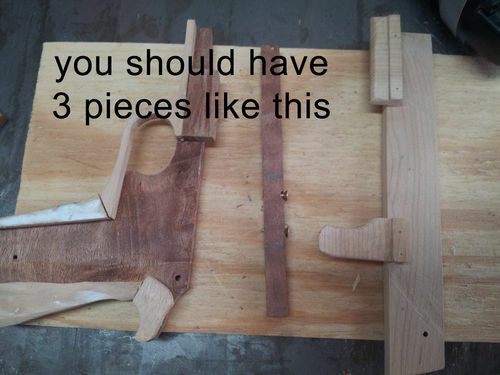 Then do the same for the left body piece. Then start some finish sanding. 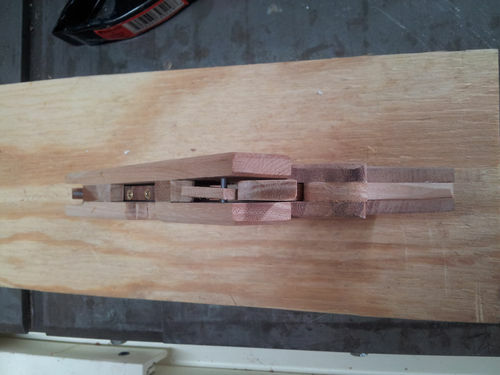 Take the nails you used for temporary pinning and cut them down and insert to hold the hammer and wheel in place. Shape and sand the grips. 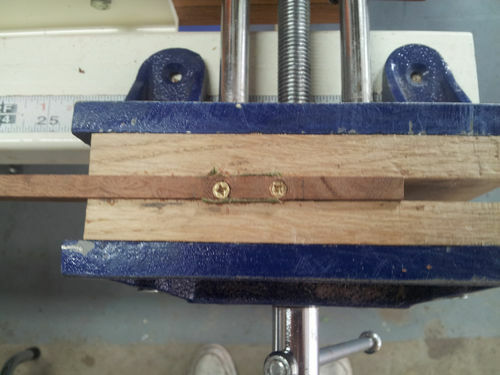 Pin in place using existing holes and glue. Shape and sand the locks. You might want to thin them a little and screw in place so the swing out of the way. 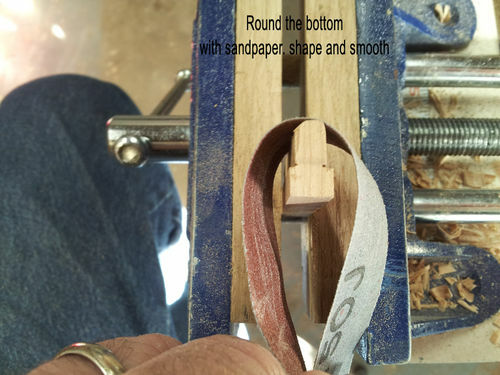 Sand, shape, sand, shape, sand, shape till you are happy.. then finish with your favorite finish. You totally rock! Personally… I am a bit AR… So I really appreciate the details and organization! Wow! Cool! Good instructional. 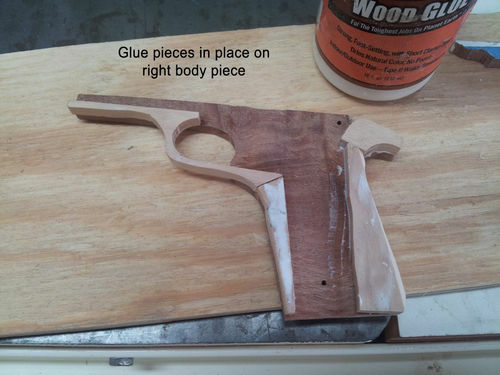 Working on the gun now. Started it before I found your instructions. Am using inches also. 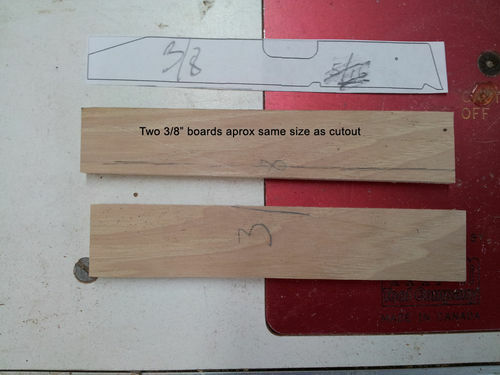 Same thicknesses as you only using birch plywood. I made a SketchUp model to help which is at https://www.youtube.com/watch?v=5TdYw8iEoPk . The SketchUp model is available on my web site at http://worksgunwerks.weebly.com/the-downloads.html . The model is being updated as work continues. Will upload new model when finished. Note: I also accidentally have the ejector on the wrong side (model is correct though). Here is my version of the 1911. 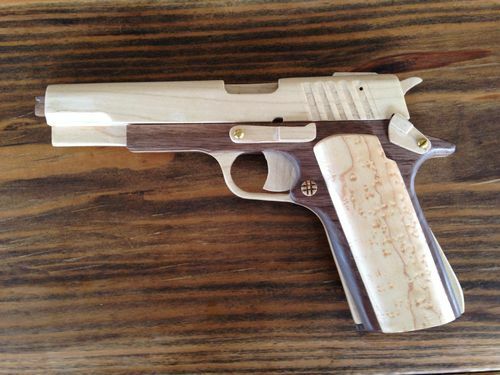 Made it with maple and walnut and finished it up with Birdseye maple grips. 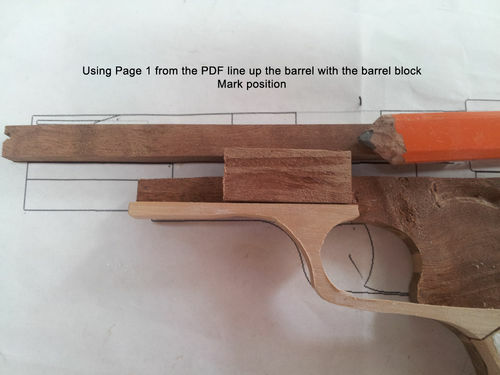 hi, the links to download the M1911 wont let me download the plans :-( I would love to try and build this so could you send me the pdf to my email address please nick?? I found the PDF file & emailed it to Ian. (At least, I THINK it’s the correct one; it seems to match the file on SCRIBD.) If anyone else wants a copy, just let me know. Those are better than the average rubber band gun! Nice project, added to favorites.